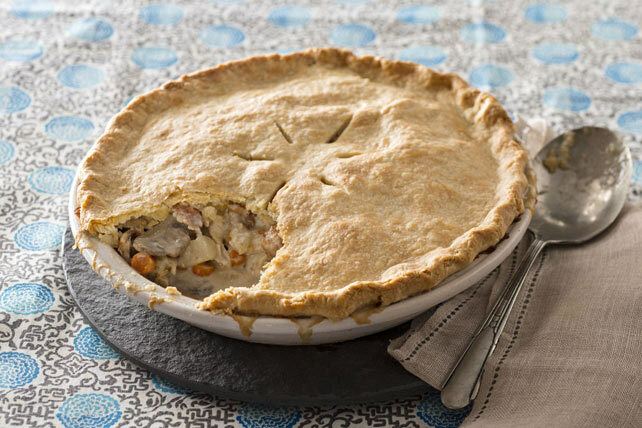 Chicken pot pie is nearly always a guaranteed win. Add bacon, and your odds are even better. Add a cream cheese pie crust? That's a home run for sure! Prepare dough for Foolproof PHILLY Pie Crust Recipe and refrigerate as directed. Cook and stir bacon in Dutch oven or large deep skillet on medium heat until crisp. Remove bacon from pan with slotted spoon; drain on paper towels. Discard all but 2 tsp. drippings from pan. Add vegetables and garlic to reserved drippings in pan; cook 5 min., stirring occasionally. Add flour; cook and stir 1 min. Gradually stir in broth. Bring to boil. Add cream cheese; cook and stir 1 min. or until cream cheese is completely melted and mixture is well blended. Remove from heat; stir in chicken. Spoon into 9-inch deep-dish pie plate sprayed with cooking spray; top with bacon. Heat oven to 400ºF. Roll out pie crust dough into 10-inch round between 2 sheets of waxed paper; place over chicken mixture. Flute edge, sealing crust to edge of pie plate. Cut several slits in crust to allow steam to escape. Place on baking sheet. Add 1 Tbsp. chopped canned chipotle peppers in adobo sauce to chicken mixture before spooning into pie plate. Substitute a shallow 1-1/2-qt. casserole dish for the pie plate. Place 1 cup flour in large bowl. Cut in 4 oz. (1/2 of 8-oz. pkg.) softened PHILADELPHIA Cream Cheese and 1/2 cup butter with pastry blender or 2 knives until mixture resembles coarse crumbs. Shape dough into ball; flatten into disk. Wrap tightly with plastic wrap. Refrigerate 1 hour. Place dough between 2 lightly floured sheets of waxed paper; roll out to desired size. Discard waxed paper.